Dogs, just like people, might suffer from allergies and take Benadryl for it. 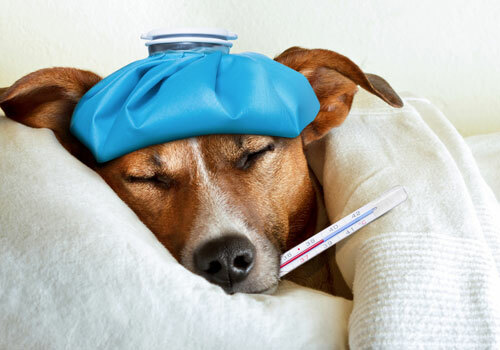 Benadryl for dogs is a wonder medicine in its effectiveness. Diphenhydramine is the generic name of its active ingredient. Benadryl is only the brand name; when buying this over-the-counter drug, it is very important to check the back label. When exposed to an allergen, your pooch will experience a whole variety of unpleasant symptoms, such as itchy and runny eyes, itchy and scabbed skin and base or back of the tail, itchy and infected ears, sneezing, vomiting, diarrhea, swollen paws and more. All of those symptoms come to rid of the allergen. 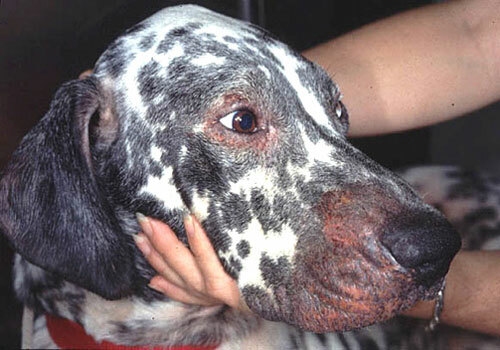 As an unfortunate continuation, these dogs might also develop bacterial or yeast infection. This, in turn, may bring to a hair loss, crusts or scabs on the skin. Benadryl, with diphenhydramine as its active ingredient, is a safe and helpful medicine. Taken properly and in the right amount, it will make life easier for you and your pooch. 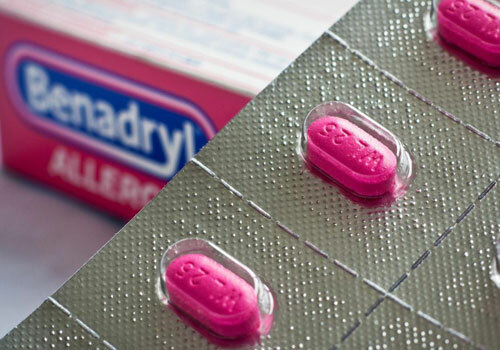 Benadryl is a brand name of an allergy relieving drug. It usually stands for antihistamine called diphenhydramine. The latter is normally prescribed to treat hay fever and various symptoms of allergy. It is also used in drugs other than Benadryl, such as following: Benylin, Panadol, and Nytol. Benadryl, in addition, sometimes might contain ingredients other than diphenhydramine. When buying Benadryl over the counter, it is extremely important to thoroughly read the label of contents. Many a time, it will include other elements, like Cetirizine or even Pseudoephedrine or Acetaminophen. The latter two aren’t safe for dogs. Diphenhydramine (DPH, DHM), Benadryl’s active ingredient, is a 1st generation antihistamine which is also used treating drug-induced Parkinson. This medicine is available to purchase over-the-counter. One can easily find it in a drugstore, a pharmacy or a grocery shop. Because of its sedative side effects, it can also be used in treating mild anxiety, sleeping problems or distress. Benadryl comes in different consistencies. It is available as tablets, gelcaps, liquid, and ointment. Different forms might have different concentration of the active element. It is important, therefore, to check those before conducting the medicine to your pet. When treating, it is always good to remember that, first of all, before we make it better, we aim to do no harm. Benadryl can be used for different conditions. Most of them are listed below. In this scenario, Benadryl is widely prescribed and recommended. If your pet is experiencing a food allergy, it is a good idea to get him checked by the vet. If you aren’t sure that the allergy isn’t causing your pooch some other problems that you can’t see, get him checked. 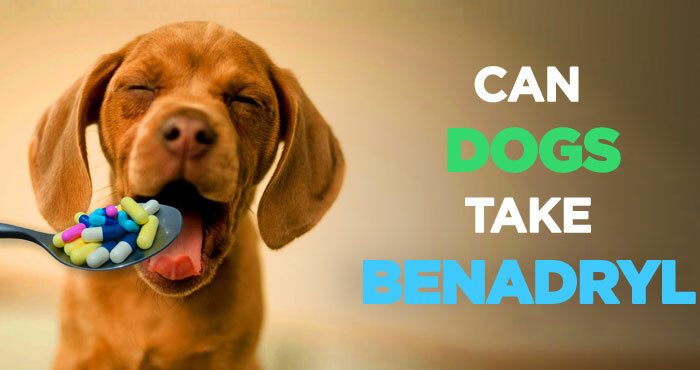 If, as oppose to that, this isn’t the case, then Benadryl might be the right choice for your furry friend. Just like humans, many dogs will react negatively to being vaccinated. Whether it is at a doctor or at home, the fact of being stung with a needle doesn’t appeal to them, to say the least. 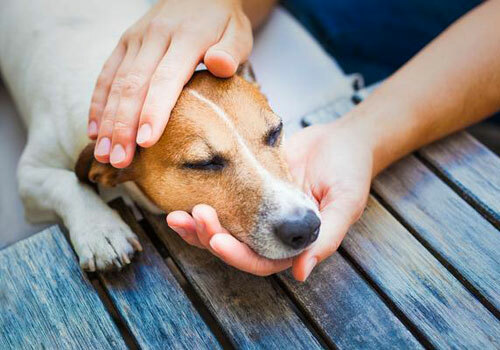 Giving dogs Benadryl half an hour before the action will help reduce stress. Some vets specifically recommend doing so. An anxious dog is unhappy and can even be dangerous. Some dogs will react fearfully to loud noises, especially exploding ones. It is not surprising; humans have that too, kids in particular. Benadryl will have a calming effect due to its sedative properties. It is important to remember that administration of drugs to pups differs from that to adult dogs. Their organisms are not yet fully developed, and they might react stronger. To be on the safe side, always consult with your vet when considering Benadryl for puppies. A bee sting might produce an allergic reaction. But even if not, the stung spot will be itchy and swollen. In that case, Benadryl will help to reduce those symptoms. If it is only a local reaction, Benadryl can be applied locally in its ointment form. If an allergic reaction develops, it can be taken as a tablet or even in an injection. Depends on the severity of the reaction, a visit to the vet might be needed. Flying, as well as sailing, might be a stressful occasion for your pooch and cause him distress. It might also trigger motion sickness. Benadryl can help here with both. It is used as a motion sickness medicine, and together with the relaxing/sedating effect makes a perfect choice. Plan your journey, so to say. Benadryl for dogs can be administered once in every 8-12 hours and takes up to half an hour to start working. 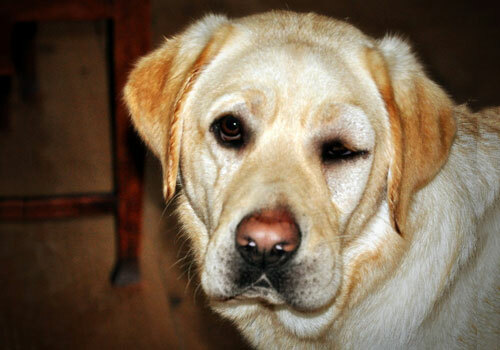 Hives can appear in dogs as well as they can in humans. This condition features raised, round, itchy bumps. Because the bumps are raised, the dog’s hair will stick out in places. Eyelids can also become affected by this ailment. Hives, aka Urticaria, together with a swollen face, aka Angioedema, seem to be a common result of an allergic reaction in canines. Benadryl has been found effective in reducing that condition. There are two types of histamine in the human body: H1 and H2. Dogs aren’t different from us in that. Histamine is a small molecule which participates in normal and pathologic processes in the body. It attaches itself to the cell’s receptors and plays a crucial role in allergic and inflammatory activities. When histamine attaches to the H1 receptors, respiratory problems, itchiness and swelling will occur. If it were to attach to H2, it would be showing an altogether different reaction. The reaction of those receptors is very similar in humans and dogs. That is why giving dogs Benadryl, when allergy appears, is helpful. Benadryl, in its various forms, usually contains Diphenhydramine as its primary ingredient. It inhibits the H1 receptors, thus blocking the spot for histamine. By doing that, it assures that the upsetting factor isn’t getting close to the cell. By staying away from the cell, it can cause no harm. In addition to blocking H1 receptors, Benadryl is also disrupting the work of another element, called Acetylcholine. By preventing this natural substance, the medicine is helpful against watery eyes and runny nose. Used alone or adjoined with other drugs, Benadryl is also found effective in treating muscle stiffness and tremor. These are often linked to Parkinson disease. This is a very legitimate question, since this medicine wasn’t made for dogs. This is a medicine for humans and it has not been approved by the FDA. Nevertheless, veterinarians have been giving this drug to dogs for years. It isn’t new for them to tell a dog owner to buy it OCT and administer it to their pooch at home. You can give your dog Benadryl and do it in the comfort of your own dwelling. There are a few important factors to bear in mind, though. Firstly, Benadryl is merely a brand-name. There are other generic drugs with the same active ingredient, and they will be known under a different name. Many times, drug stores will have their own generic diphenhydramine to sell. Secondly, Benadryl comes in various forms. These include tablets, oral liquid, capsule, dissolving film tablet, gel, spray, cream, and injection. You can choose the most convenient form of this medicine for you and your dog. A thing to remember, though, when treating puppies, is that they might react differently. Always consult a vet before giving Benadryl to puppies. With young dogs, just like with children, more cautious should be exercised. Thirdly, an aspect to consider is the fact that some forms of Benadryl comprise more than only Diphenhydramine. Liquid Benadryl, for example, contains also alcohol and is best kept clear of. Some Benadryl tablets will contain additional histaminic elements. One of them is called Cetirizine. It is much less effective in treating allergies. Cetirizine is also non-helpful with anxiety, distress or insomnia. Another one is Acrivastine, mostly accompanied by Pseudoephedrine which can be harmful in high doses. It is best to avoid it altogether. Last but not least is Pholcodine. It is a common addition when treating cough. Since it is rarely used with canines, it’s best to double check with your vet, if you want to use it. Knowing the right dosage of Benadryl for dogs is crucial. If you give your pooch too less, it might not be effective at all. Giving too much, on the other hand, might prove plainly dangerous. 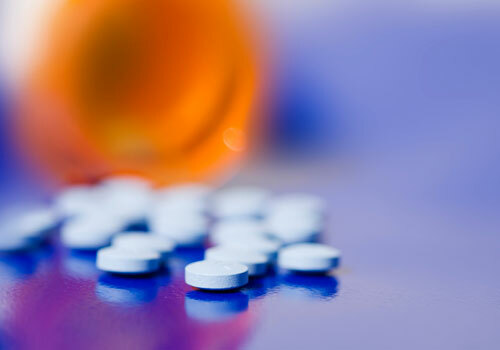 Although Benadryl is a relatively safe drug, knowing the right dosage is important. So, how much Benadryl for a dog, then? Usually, Benadryl is given at 1mg per 1lb body weight. So then, if your dog weighs 14lbs, you should give him 14mg of medicine. Tablets usually come in 25mg or 50mg. They are given 1-2 tablets 2-3 times a day. It isn’t important for that matter if Benadryl is given in tablets, capsules or liquid gel. The dosage is the same; it is roughly 1mg per 1lb bodyweight. You might choose to give you pooch Benadryl in liquid form. Then the dosage is 0.4ml per 1lb bodyweight. Liquid form has its own pitfalls, which will be discussed later on. Topical Benadryl, such as in a cream form, usually contains 1% or 2% Diphenhydramine. Fine on its own, its effects will be stronger when combined with oral antihistamines. When the allergic reaction is severe, as in snake bite, the dosage can be doubled. It is always best to seek the advice of a professional. 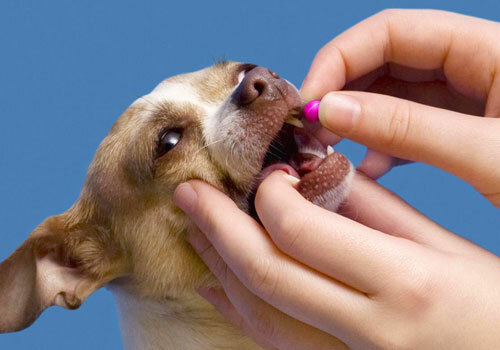 Consult your vet whenever you can before administering medications to your pet. 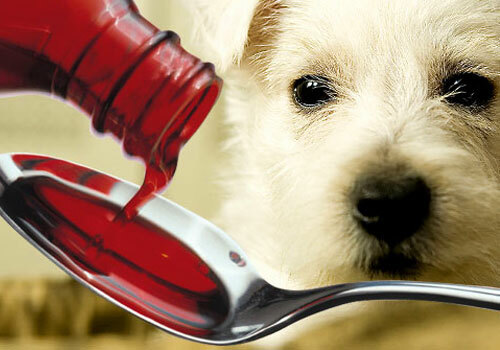 When buying liquid Benadryl for puppies, remember that the regular formula has alcohol in it. It is, therefore, recommended that you give your pooch the one for children, which hasn’t got alcohol. It does, however, contain sodium. It might be non-compatible with dogs that have a heart condition, high blood pressure or kidney problems. It is a good idea to try a small dosage first, to see how your pet reacts to it. A piece of tablet can be crushed and mixed in the dog’s food. This way it will be easier for them to take the medicine. Same goes for liquid and gel caps. Simply open it up and mix a bit with some of the more liquid substance you can give them, like gravy, for instance. One can never be too cautious when giving medicine. As safe as Benadryl is, it is still a must to talk to your vet if your dog is pregnant, suffers from any medical condition or is taking other medicaments. Tell your vet everything that will give them a clearer picture about your pooch. The more information they have, the simpler it is for them to decide. It is crucial that you inform them about any other drug your dog is taking. If there is a new development in your dog’s health, let the vet know about it. As every other conventional medicine, Benadryl, too, has side effects. Benadryl is considered to be a very safe drug. Its side effects are mild. Normal side effects can show up within an hour or even less from the moment of intake. Drowsiness seems to be the most common Benadryl side effects in dogs. It is so much so, that often the medicine is used to help canines to relax and doze off. Diphenhydramine, Benadryl’s active ingredient, is actually used by many people as a light sedative. In the case of serious development of one of the last four, seek immediate veterinary help. Obviously, stop giving your dog the medicine at once. A dog that develops severe reaction might be allergic to the medicine. While Benadryl is a very safe drug to give to your pooch, when taken in too large amounts, it is dangerous. It is highly unlikely for the dog’s owner to give his furry friend an overdose of the drug. But dogs are curious animals, and puppies are as playful as any other child. So, accidents happen. 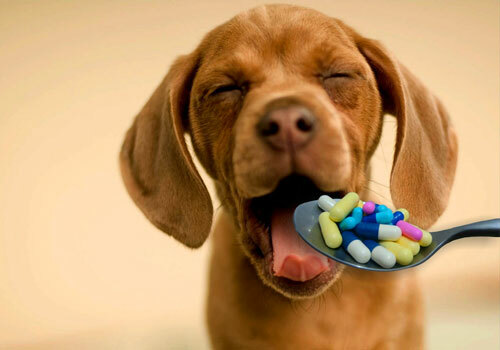 If your dog had accidently gobbled up a whole bottle or devoured a pack of tablets, it is due for an overdose. 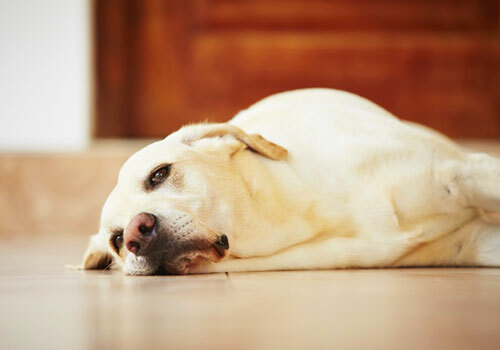 Benadryl overdose in dogs shouldn’t be underestimated simply because it is a mild drug. In the case of overdose, seek professional help immediately. There were precedents in the case of Benadryl overdose where a dog had taken up to 16 times the normal amount. This dear pooch survived because his owner was quick about bringing him to the vet. Be alert. Make sure to check the drug cupboard. Pay attention to your dog. Make notice if anything unusual or excessive shows up. Do pay attention to how many tablets there were left in the pack. Check the Benadryl bottle to see if it still has the same amount of liquid as before. Remember that dogs are much like kids, especially when they are pups. Just like you wouldn’t leave a medicine approachable for kids, don’t do it for dogs. How to Give Your Dog Benadryl? So you’ve decided to opt for Benadryl for your dog. You know that this will help him with allergy, itchiness, insomnia or motion sickness. Firstly, what you must do is weigh your dog. Once that is done, you will be able to make an informed decision regarding the appropriate dosage. That is, of course, if you are giving him the medicine yourself. The proportions of Benadryl for dogs are 1mg/1lb body weight. Sometimes, when symptoms are severe, a double dosage is given at 2mg/1lb. When giving Benadryl to pups, it is best to talk to the vet prior to that. 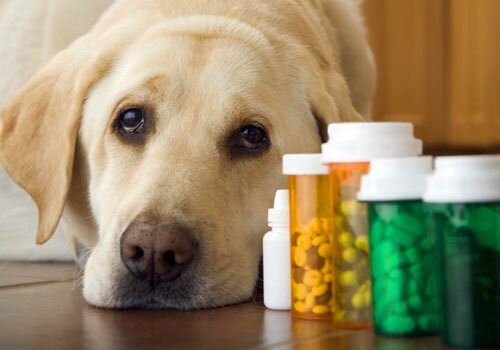 Pups absorb and react to medications differently. To save yourself unneeded troubles, you can hide the tablet in the dog’s food. 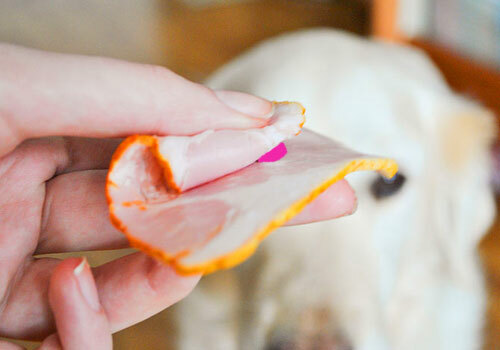 Whole or crushed, make it invisible, and your pooch will swallow it without even noticing. You can also sneak it into a tasty bar. This will increase the probability of the med being eaten and unseen. Give him some of the regular bits first, so it’s all as usual. Then continue with the medicated one. If you’re giving dogs Benadryl in a liquid form, you can squirt it into the dog’s mouth through a syringe. That way you have full control over the dose and intake. That is, of course, if he lets you. You can train him beforehand with water, so he gets used to the sensation. Once that’s accomplished, go for the real thing; he won’t know the difference. We have discussed Benadryl’s benefits, pitfalls and how to administer this drug to dogs. After having established what Benadryl is and how to get the most out of it, let’s do a step-by-step follow-up. 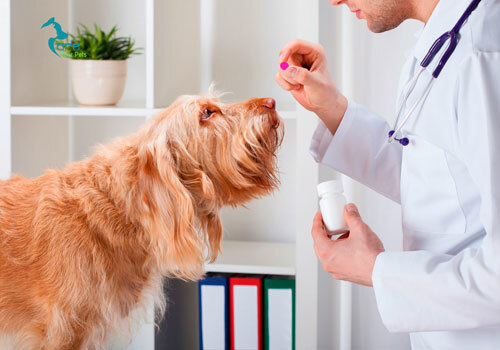 This section will try and cover the nine most common questions dog owners come up with when considering giving Benadryl to their furry companions. 1. Can you give a dog Benadryl? Is Benadryl safe for dogs? Benadryl is considered to be a relatively safe drug with mild side effects. So, yes, generally speaking, it is safe for dogs. We must remember, though, that Benadryl is merely a brand name. The active ingredient of this medicine is, in fact, Diphenhydramine. This is a safe and efficient antihistamine which we are ready to expose our pooch to. It is important to check the label of contents on the drug box. Anything that contains other than Diphenhydramine is really unbeneficial or even harmful for your dog. 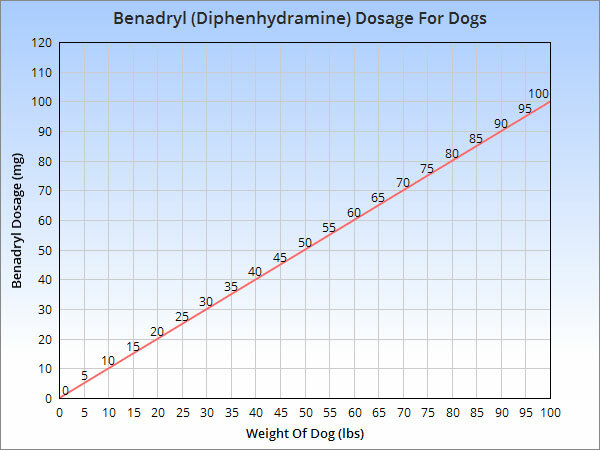 Basically speaking, the advised Benadryl dosage for dogs is 1-2mg/1lb body weight. In kilos, that would equal to 2-4mg/1 kilogram. The dosage prescribed depends on the severity of the symptoms. For liquid, quantities are different with 0.4mg/1lb. The medicine should be given in equal intervals of 8-12 hours. We have added a Benadryl dosage chart above in the article. Normal Benadryl intake should occur every 8-12 hours or 2-3 times a day. It is best to administer this medicine with food. If you are planning on giving Benadryl to dog before a journey, give him the medicine about half an hour prior to that. If the dog is taking Benadryl regularly and has skipped a dose, it should be given as soon as possible. 4. How long does Benadryl take to work in dogs? 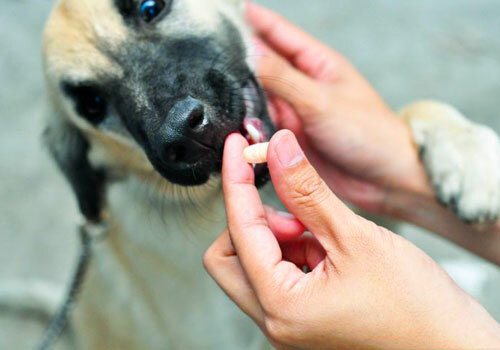 An oral dose of Benadryl for dogs will reach top blood concentration within 2-3 hours from the moment of consumption. Its effects will last for 4-6 hours. If the drug is given for insomnia, it should be administered at around 30 minutes before bedtime. Same goes for when it is given to help the pooch visit a vet, perhaps for his vaccinations. Some dogs get very stressed in that situation. Giving them Benadryl at least 30 minutes before the visit might help calm the nerves. 5. When should I avoid Benadryl on dogs? Avoid giving your dog Benadryl if you know of any health issues which might be influenced by the intake. If your dog is taking any other medications – antihistamines or not, – it is crucial that you talk to your vet and hold off giving Benadryl. Avoid administering Benadryl if you are noticing that your dog has developed severe reaction to the previous dose. Avoid liquid Benadryl except for the children’s formula. The adults’ formula contains alcohol and can harm your dog. 6. What are the common side effects of Benadryl in dogs? Every medicine has its toll of side effects. The more familiar we are with them, the better it is. 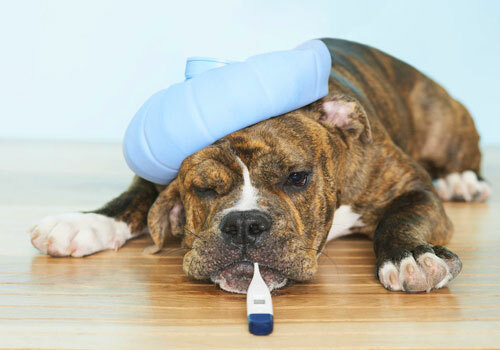 The most common Benadryl side effects in dogs are as following: dry mouth, drowsiness, urinary retention, sluggishness, excitability, and drooling. These effects are normal and shouldn’t make you worried. If, however, you see that the effects are getting stronger and persistent, seek professional advice. 7. Can I give my dog liquid Benadryl? The answer to this question is dual. On the one hand, yes you definitely can. On the other, remember that regular liquid Benadryl contains alcohol and might be harmful to your pooch. There is a choice of children’s formula of Benadryl. This is a better option, generally speaking. It has, however, sodium chloride inside, which can, depending on your dog’s health, be a factor of less or more importance. Sodium chloride is a salt and as such, isn’t recommended for high blood pressure or kidney problems. 8. Can I give my puppy Benadryl? Some veterinarians say it is absolutely safe to give Benadryl to puppies. The dose, in that case, is as for adults, standing at 1mg/1lb body weight. Still, we must remember that puppy’s body is less developed, and its organism is more susceptible to certain elements. It is quite safe to presume that children’s formula Benadryl should be just fine for pups. In any case, if you want to be on the safe side, seek the opinion of a professional before administering medicine to puppies. 9. Can you give dogs Benadryl made for human consumption? It is absolutely safe to give your dog Benadryl made for human consumption. However, important factor is that it is only Diphenhydramine which is 100% safe for the dog. In human medicine, it is common to find this ingredient among others. While these other elements are absolutely fine for humans, they might be harmful to dogs. Therefore, seek out only pure 100% Diphenhydramine containing formulas, and your dog will be just fine. It is safe to say that Benadryl is a relatively secure medicine as medicines go. It is important to get to know and stick to the correct Benadryl dosage for dogs. When administering it to your dog, you can hide it in his dog food. If you throw him snack bits, you can start with regular ones and then continue with the one containing the hidden tablet. You can use Benadryl for dogs before flying or even visiting the vet. Give it to your pooch about 30 minutes before the event, and he’ll be just fine. Be attentive to any abnormal behavior the dog might exhibit. Make a distinction whether it is a normal side effects of Benadryl or anything more that perhaps requires seeing a vet. It is best to stick to the 100% pure Diphenhydramine formula. This one is the safest of all and surely won’t harm your beloved furry friend. Everyone should know the benefits of benadryl! This past summer I had my benadryl on standby just in case one of my little ones got allergies or stung be a bee. Luckily, I didn’t have to give them any this year, they actually had a good summer, running around smelling the trees, flowers, and having a blast! Thanks Janey. I am glad you found it helpful. Yes. It’s OK to take Benadryl for allergies, while your dog is on Prednisone. BUT Prednisone is a drug that should be taken strictly as prescribed. Benadryl would be the first choice for mild hives, Prednisone should only be given on the advice of your vet, it’s serious stuff (a steroid) and has side effects. You don’t give Prednisone without knowing it’s needed. My puppy is 7 months old and weights 25 lbs. She is extremely hyper. Constantly jumping and constantly on the go. More so than the ordinary puppy. Can i give her Benadryl to calm her down at least a little. This was suggested to me by her trainer. Benadryl is safe for dogs. But remember that the puppy’s body is less developed. So the children’s formula Benadryl should be fine for puppies. Although, do not make it a habit and don’t overdose. Better safe than sorry. Seek the opinion of a professional veterinarian before administering medicine to your puppy.